Active in the law and politics from an early age, Forward served as a U.S. Congressman, 1822-25. By the early 1830's, he had allied himself with the National Republicans and, in 1834, was instrumental in forming the Whig party. Upon his election to the presidency, William Henry Harrison named Forward to be the first comptroller of the currency and, upon Harrison's death, Forward was named Treasury Secretary in Tyler's cabinet (1841-43). He also served as American charge d'affairs to Denmark (1849-51). WALTER FORWARD DS. 1pp. 8" x 10". Treasury Department. March 16th, 1842. A partly printed document signed "W Forward" as Treasury Secretary. 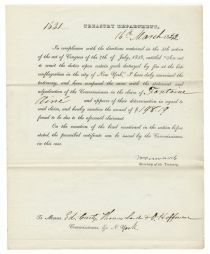 The piece states: "In compliance with the directions contained in the 4th section of the act of Congress of the 7th of July, 1838, entitled 'An act to remit the duties upon certain goods destroyed by fire at the late conflagration in the city of New York,' I have duly examined the testimony, and have compared the same with the statement and adjudication of the Commissioners in the claim of Fontain Ainé and approve of their determination in regard to said claim, and hereby sanction the award of $198.19 found to be due to the aforesaid claimant. On the execution of the bond mentioned in the section before stated, the prescribed certificate can be issued by the Commissioners in this case." The piece is in choice condition.